I’m very happy with this Taylor & Olive Tuscaloosa wool rug overall. The price is fantastic for a large hand tufted rug, especially when compared to major retailers such as Pottery Barn. There were some imperfections such a couple of snagged loops and a missing dot in another area but it’s not very noticeable. Despite the imperfections the rug looks high quality, authentic and a lot more expensive than it actually is. Everyone is asking where I bought it! Give your home gentle color and textured depth with this area rug. The raised trellis pattern and hand-tufted wool construction lend a soft and durable accent you can enjoy for years to come. 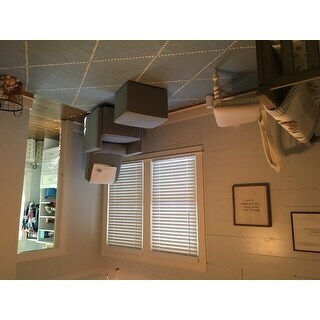 Dimensions 72.0 In. X 6.0 In. X 6.0 In. Really love how soft this rug feels without being too thick (our closet door needs to open over the corner of the rug). 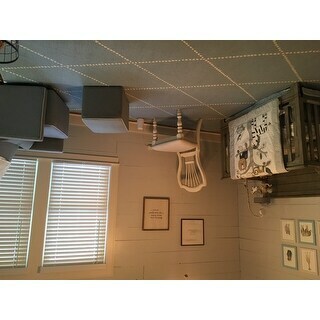 Purchased the rug for granddaughter's nursery. I expected the colors to be a bit brighter...the white dots are more of a cream color. The dots of the trellis are about a 1/2 inch in diameter with about as much space between each "dot". The pink isn't bright, but makes a nice neutral pink that blends in with the other pinks in the room (i.e. painted pink flowers on one wall). The comfort of the rug is the highpoint. Once this little lady is able to sit and crawl around, it will be a great place for her to do just that! 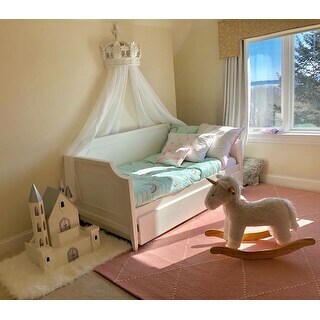 Option: Baby Pink - 7' 6" x 9' 6"
Bought for my daughters room and it's perfect. Color is just as shown and quality is just like my pottery barn rug I paid 900$ for. This rug doesn't shed or smell!!! We just got it but I don't see that changing. 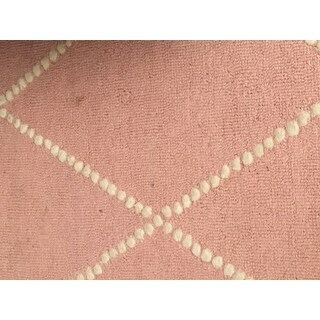 This beautiful rug goes splendidly in my daughters' room, which also has soft pink accents. The shade of pink is subtle and soothing to look at. Sturdy rug. Love it! Option: Baby Pink - 8' 6" x 11' 6"
It's beautiful, a soft pink with ivory dots. Very thick and soft. Looks exactly like the picture. Very pleased with the rug. This is a great looking rug. Purchased it to go in our nursery and we are more than happy with it. Seems to be pretty true to size described. Excellent quality! Looks like the photo. This rug looks beautiful and just like the pictures! My only complaint is that it sheds a lot when vacuuming, but I’m thinking that will go away in time. Overall, I’m happy with the purchase! I'm very pleased we selected this rug as there were many we considered. The color is true to the photo. The rug rolled out nicely with only a slight curl on one short edge which we weighed down to flatten it. We used a rug pad beneath. I highly recommend this rug. The rug is stained black in certain spots. I would never order a rug from here again. Such a hassle to replace and get what I paid for.definatly not like the picture. It is dirty along all the edges and some of the white dots are a dingy grey. Seems like it sat in a dusty room for awhile. Also, it's not very soft. Feels fine on your feet but not very soft for a crawling baby or toddler to play on. 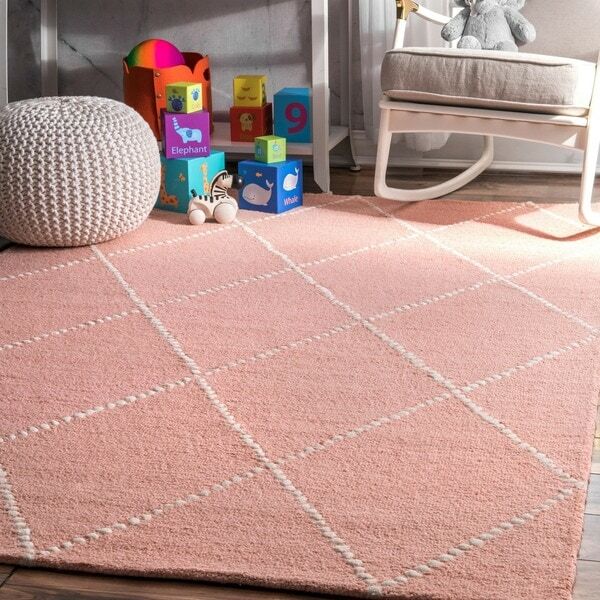 Purchased for my daughters nursery after her first rug got really dirty, this one has a good pile that is not overly thick. Love the color. Perfect for her space. I donn’t really care for this carpet. It leaves fuzziys all over the room in turn the get carried throw out the house. I absolutely love this rug. It looks so much better then picture. It’s thick and the quality is excellent !! Very very happy with it! Love the rug. True to color and is well made. Nice and thick. This is a very plush beautiful spring look I love it. This is a beautiful rug and I’m so happy I took the plunge to buy it online. I was worried that buying a rug online would not allow for seeing and feeling the quality of the rug but when I saw this wool rug I decided to take a chance. 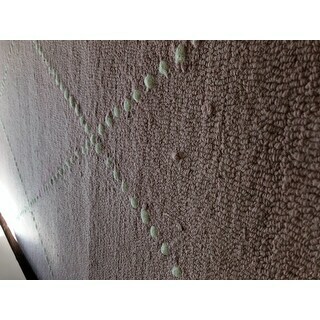 It’s really a good quality wool rug and exceeded my expectations. Love it! 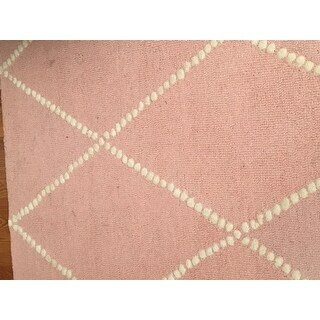 "Is this rug a DARK pink or LIGHT pink? Thanks!" "I wanted to order this in a smaller size say 5*8 or 4*6 , where can I find the link?" Unfortunately, it currently only comes in the size option shown. For a nursery, was lookin for a soft pink. It’s perfect for my girls room! "Would you describe this light pink as a blush tone or bubblegum? Its difficult to tell on the screen. Thanks!" This is a blush tone.